Graham Media Group stations, each in a top-70 market, share a common tradition of journalistic excellence and a common dedication to local news and informational programming. The Graham Media Group's stations are among the broadcast industry's most honored television stations, winners of numerous major awards including the Peabody, Columbia-Dupont, Ohio State and dozens of local and regional Emmys. All of the stations strive to rank first in viewership in their respective markets. Career opportunities at the Graham Media Group's stations range from the highly visible on-the-air positions of news, sports and weather anchors and reporters to important behind-the-scenes positions like producers, directors, writers, technicians, sales personnel, accountants and many others who keep the stations operating 365 days a year. Breaking news stories occur at all times of the day and week, so a variety of work-day and work-hour schedules are necessary. There are full-time and part-time entry level and trainee positions at all of the stations that provide recent graduates with excellent learning opportunities in news, programming, sales, engineering and other areas. They offer the traditional "foot in the door" opportunities that can lead to more advanced positions at Graham Media Group's stations and elsewhere in the television industry. Most employees are directly involved in the daily production of the stations' most important product: local news. All Graham Media Group's stations broadcast several hours of news every day. Each station employs anchors, reporters, producers, videographers, directors, editors and technicians needed to produce the news programs. These people fill approximately seventy-five percent of the positions at a Graham Media Group's station. Most of the anchors and reporters employed by the Graham Media Group's stations are experienced journalists who gained their experience in smaller markets. Their educational backgrounds are generally in journalism or the liberal arts, and they are expected to be highly skilled news writers. They must have the ability to present news, sports or weather in a manner the television audience finds interesting and attractive. Newscast producers oversee the production of individual newscasts and assume responsibility for both content and on-air look. Producers are expected to be skilled at "constructing" newscasts that meet high journalistic standards and make use of the contemporary news production equipment and techniques available to them. A producer must also be a good writer and have the ability to communicate with reporters and other news professionals in a fast-paced environment with constant deadline pressure. 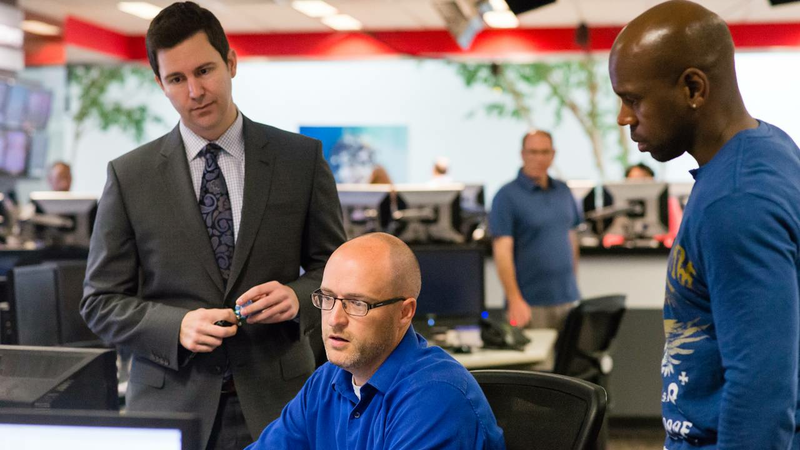 Each newsroom has an assignment desk staffed with one or more assignment editors depending on the time of day and day of the week. Assignment editors must be practical, creative and skilled in developing story ideas and assigning the reporters and videographers to cover them. The assignment manager and key assignment editors are usually experienced journalists, but occasionally there are entry-level opportunities as desk assistants. Videographers / editors must have the ability to videotape and edit news stories skillfully and quickly, often under deadline pressure. They must be able to use all contemporary electronic news-gathering equipment and work well with reporters and assignment editors. Engineers work with all of the audio and video equipment in state-of-the-art equipped TV stations. Technicians are assigned to maintenance or operational functions within the engineering department. These highly skilled technicians have received special education and training, either at the college level or technical training in broadcast engineering. This background allows them to operate, repair and maintain all equipment. As in all departments of a TV station, engineers work varying shifts in order to cover day, evening and weekend TV news and programs. Programming (other than news) is the responsibility of the program department. This includes contact with the networks, acquiring programs, strategic placement of programs in various time periods taking into consideration viewer dynamics, and the production of documentaries, magazine shows, specials, and other non-fiction types of TV programs. There are director and producer positions in the programming department similar to those in news. A journalistic background is helpful. Production crews work together on sets, props, lighting and sound for all live or taped newscasts or programs. Teamwork between directors, audio / visual technicians, producers and artists helps to create the best studio environments for presenting all types of TV programs. The administration department is responsible for the station's financial controls and administrative services. It consists of the business office, accounting, building services, personnel, payroll and labor relations. Under the supervision of a business manager, the department employs accountants, accounts payable and receivable, payroll, building maintenance and human resources personnel. Their education and work backgrounds are in the area of business management, accounting, general maintenance and human resources. Full-time and part-time positions are necessary to cover all aspects of administration of the TV station. The sales department is charged with the responsibility of achieving the station's revenue goals by obtaining local and national advertising support. The account executives and other sales personnel have usually had sales and marketing experience in smaller TV markets, radio, newspaper or advertising agencies before joining a Graham Media Group's station. Sales personnel contact local and national clients to sell commercial time on our air. Most of the sales personnel are on commission. There are also occasional opportunities for sales trainees to learn from seasoned account executives about TV sales and marketing techniques. The operations department works closely with the sales department. Operations maintain the sales inventory and station log which is the daily record of everything that is broadcast minute\0xAD by-minute. The operations department is highly computerized so each person is responsible for daily data entry and retrieval duties. Research provides the sales department with material designed to enhance the department's ability to sell advertising. They also provide the creative services department with rating materials to help promote the station's newscasts, programming and on-air talent. This information is gathered from local and national rating services, polls, census figures and audience feedback. It is used to make recommendations on TV news format and content and also for program acquisitions. The creative services department is, in essence, the station's in-house advertising agency and employs personnel with skills comparable to advertising copywriters, artists and other creative people that are usually found in ad agencies. Graphic artists work with manual and computerized tools to design station logos and on-air and print promotional materials. Personnel in all departments stay in contact with community leaders and are alert to community events and issues to include in our local newscasts and programs. We produce public affairs programs and public service announcements and take part in a variety of activities to help serve the communities in which we live.